Let’s face it, we’re in an age where technology is constantly being created to provide services we didn’t even know we needed. Art is no exception. One such revolution is the use of augmented and virtual reality to bring new and engaging experiences with art. The Mauritshuis, a museum, found in the heart of The Hague in Holland, is the host of a treasure trove of works from the Dutch Golden Age. One such artist is Rembrandt van Rijn, which the museum has one of the most impressive collections of works by. However, to commemorate the 350 year anniversary of the death of this Dutch artist, the museum teamed up with virtual reality startup Capitola to release an app that transports you into one of the Dutch artist’s most prolific paintings. 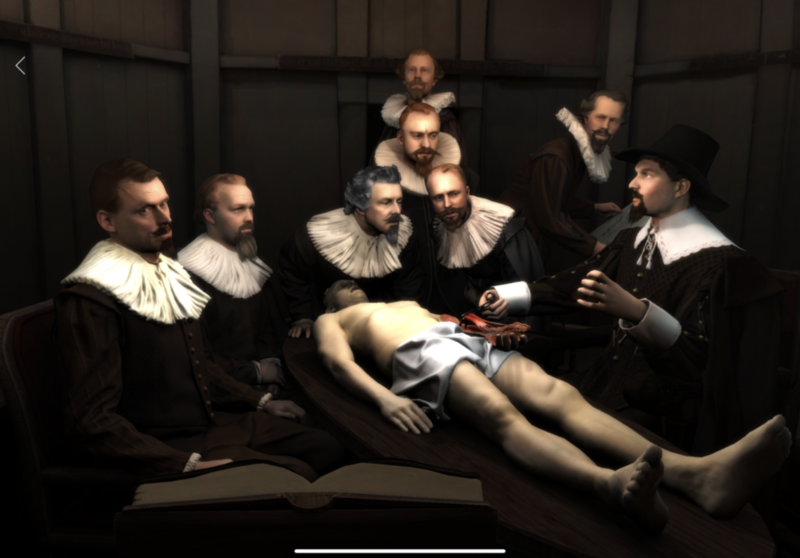 The app, entitled “Rembrandt Reality” allows you to be immersed into one of the Dutch master’s most prolific paintings—“The Anatomy Lesson by Dr. Nicolaes Tulp (1632).” In addition to allowing you to walk around the anatomical theatre, the app also will educate you about the painting and its historical context. So, how do you go about re-creating a two-dimensional painting into a three-dimensional space? The team over at Capitola have an advanced 3D studio where they can capture a 360 degree scan of a subject that can be turned into a digital model. Using this technology, they were able to scan the original backdrop, the tower of the Waag in Amsterdam and people who looked like the original subjects of the painting. Then, they spent five months putting everything together. This isn’t the first time Mauritshuis has used technology with art. The museum has an ongoing initiative to experiment with how technology can help viewers explore news and engaging ways to interact with historical artworks. In another project with Capitola, they created an experience using Microsoft HoloLens that allowed viewers to explore the mystery and history of the painting. It’s truly interesting to see how science and technology can be a true compliment to art. I think Rembrandt knew this fact well. It’s evident in how he perfectly blended art and science through “The Anatomy Lesson by Dr. Nicolaes Tulp (1632).” But don’t take my word for it, go experience it yourself. “Rembrandt Reality” is available free on the iOS App Store and the Google Play Store.